How and why do we think about food, taste it, and cook it? While much has been written about the concept of terroir as it relates to wine, in this vibrant, personal book, Amy Trubek, a pioneering voice in the new culinary revolution, expands the concept of terroir beyond wine and into cuisine and culture more broadly. Bringing together lively stories of people farming, cooking, and eating, she focuses on a series of examples ranging from shagbark hickory nuts in Wisconsin and maple syrup in Vermont to wines from northern California. She explains how the complex concepts of terroir and goût de terroir are instrumental to France's food and wine culture and then explores the multifaceted connections between taste and place in both cuisine and agriculture in the United States. How can we reclaim the taste of place, and what can it mean for us in a country where, on average, any food has traveled at least fifteen hundred miles from farm to table? 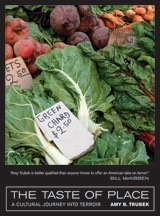 Written for anyone interested in food, this book shows how the taste of place matters now, and how it can mediate between our local desires and our global reality to define and challenge American food practices.